Looking to get something small, something quick, or maybe just a simple one session hit? We got you covered! Glass Heart Tattooing & Arts now offers our Annual Walk-In Weekend! Bring your ideas, yourself , your I.D. and your moneys, and get a single session tattoo without the wait for an appointment. Mark it down, and come swing by one weekend, say hello, and get a new tattoo! It's that time of year again! The part of the year when you are wondering, "What do I get for (Good ole what's their name) this Christmas?!?!" Here at Glass Heart Tattooing & Arts, WE GOTCHA COVERED! Our Annual Holiday Gift Certificate Special kicked off on Black Friday, and it will run until Saturday 12/23. Here is how it works; For Every $40 you spend, we will add another $10 to the total. And We will do this for ANY Amount! You want to spend $40, we will give you $50. You want to spend $80, we will give you $100. OR, You want a $200 Gift Certificate, we only charge you $160. You want a $500 Gift Certificate, we will only charge you $400. ANY AMOUNT! If this sounds confusing to you? Don't worry! We will do the math for you when you get here. Just come on down to the shop, and let us know you want our Holiday Special on Gift Certificates, then we will handle the rest. The shop is open Tues-Sat after 12 NOON. Come by any time. Or give us a call. We look forward to seeing you! We welcome "Red Rock" Charlie Hagenbach to the Glass Heart Tattooing & Arts Crew. Charlie is a native Northeast, Pennsylvania. He has been tattooing since 2011 and has become well versed in all styles of tattooing, with a focus on Black and Grey Realism & Portrait work. Check out Charlie's Portfolio in our Artists Section, and head over to the Links section to connect with him on Facebook and Instagram. If you would like to get tattooed by Charlie; drop us a line in our Contact Section, or message him direct through one of his social network sites. SpikeTV's Inkmaster Season 9 "Shop Wars"
Glass Heart's Owner and Artist, Derek Zielinski, will be appearing on this upcoming season of SpikeTV's Inkmaster. 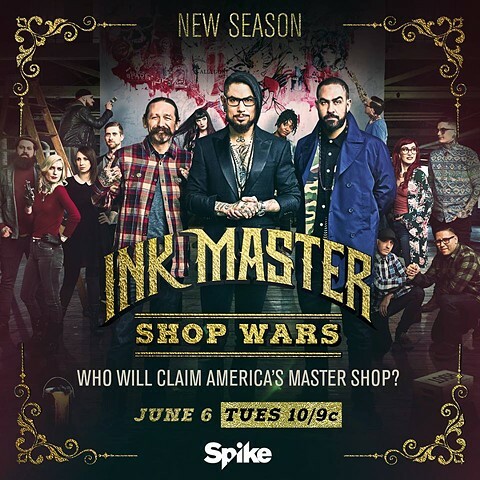 Spike TV's hit original reality-competition series Ink Master returns for a ninth season on Tuesday, June 6 at 10/9c, with the highest stakes yet and twice as much prize money on the line. This season, shops from all around the country are sending two of their strongest artists to compete for a $200,000 grand prize, an editorial feature in Inked and, for the first time in Ink Master history, the title of "Master Shop." Derek will be joining forces with his friend Thom Bulman, Owner and Artist, of Classic Trilogy Tattoos in Mattydale, NY. Together they will represent Classic Trilogy as a team, and compete for the Prize. This season will be an interesting one. We promise.